Adina of A England has surpassed herself yet again with this fantastic collection. Inspired by the classic novel “Wuthering Heights” by Emily Bronte this has truly surprised and amazed me (and everyone at work who has had the joy of seeing them!) This collection consists of 5 polishes; 4 holographic and 1 glitter. 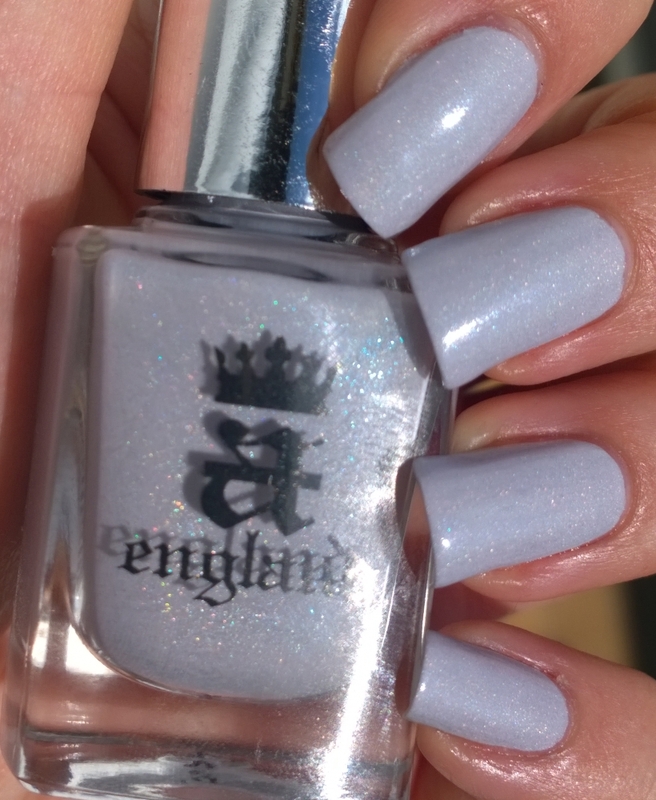 Anyone who has seen one of A Englands holographic polishes will know by now what to expect and these are just as fantastic. In regular light they are beautiful enough colours on their own but get that flash of daylight on them and they really explode into life. Cathy and Wuthering Heights are the real surprises to me and are definitely worth a purchase. The formula is the usual fantastic A England formula and will dry smooth and non-streaky within a minute provided you don’t put on too thick a coat. You can get away with 1 coat on all of them bar Cathy in my opinion but would definitely recommend you use 2 just to really deepen the shimmer and colour. Heathcliff is a bit rougher on the finish being a rather dense glitter but is still smoother than most high street glitters would dry and a nice coat of topcoat soon sorts that out. I was inspired to actually read the novel after seeing this collection (it’s been sat on my Kindle for months) so I will probably wax lyrical about that in my reviews below as well and see if my inspirations are the same as Adina’s. All the pictures are without any topcoat and taken in direct sunlight. All the polishes are available on shop.polishedpevil.com if you’re in the UK. Click on the images to get a larger picture. “Cathy” is an incredible slightly off-white holo. Clearly meant to depict the ghostly vision encountered of the tragic heroine this will flash an eerie icy blue in the sunlight along with a very subtle hint of other colours like green and yellow. This makes me think of freshly laid snow as much as a ghostly entity. For a white as well it covers remarkably well and only takes 2 coats; a friend of mine actually had it on in 1 coat though she used a thicker coat than I would. Cathy is a real surprise for me; from preview pictures she didn’t look overwhelming but I was very pleasantly surprised on my first trial of her. “Heathcliff” is my least favourite of the collection but only because I’m not a huge glitter fan. I still think this is a gorgeous polish and it feels a little different to most other A Englands. The base is more of a jelly and is a bit more sheer than you expect in the bottle, though still completely opaque in 2 coats. The glitter shines in multiple colours of silver, blue, red and I think the odd hint of purple at times, matching the darkness of character in Heathcliff in the novels yet with these surprising hints of passion he shows. 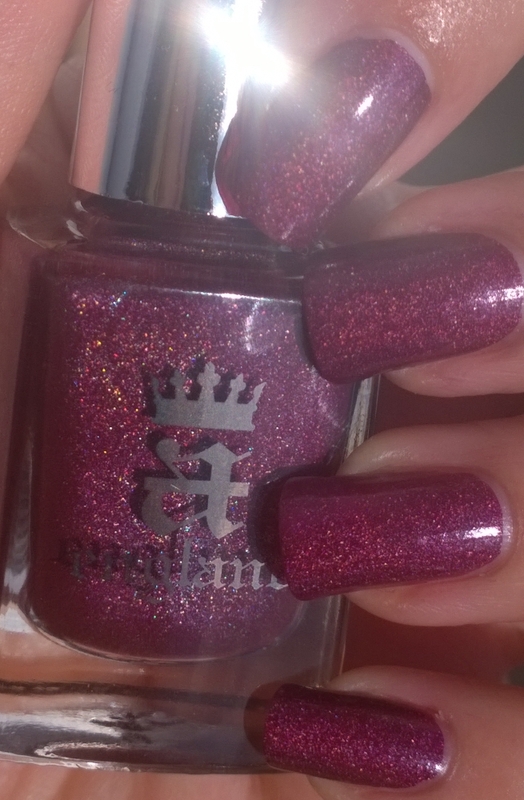 I’d definitely recommend a top coat over this one as it does dry a little rough but still less so than most glitter polishes would. “Let Me In” is a very classic shade; I’m not usually a pink fan but I do love the ones Adina does, perhaps because they’re never pure pink. This is more of a winter berry colour; to me it is the exact colour of heather in flower which is of course perfect for the moors. The name of this polish is the cry Cathy’s spirit gives outside the window but it definitely to me looks like the late summer moors. There is a shimmer of gold mixed through this as well. 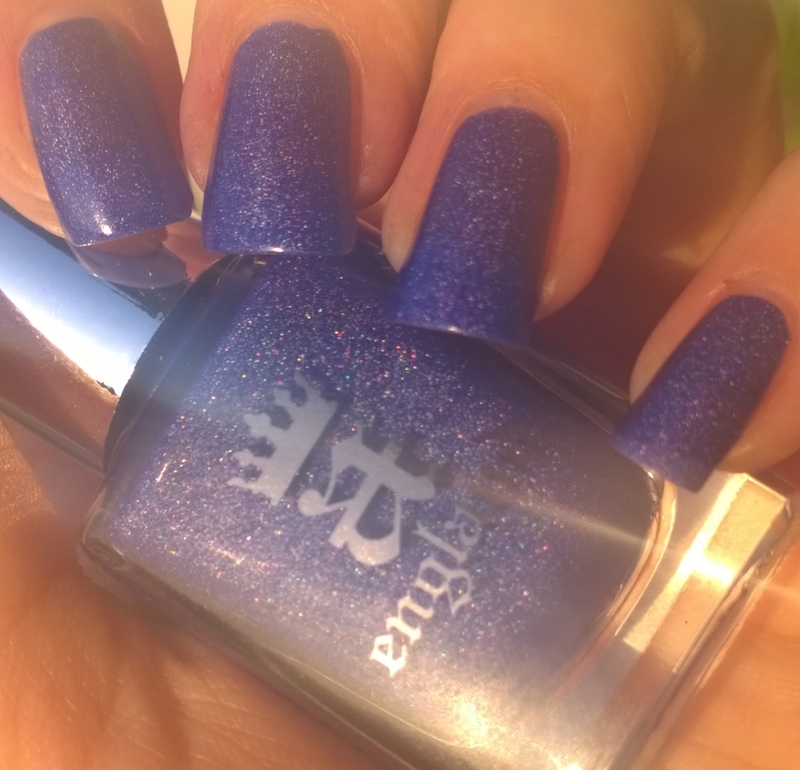 If you’ve seen Rose Bower or Briar Rose from A England this is a similar polish but is also quite different; a much deeper, more blue-toned pink and perfect for winter polish use. This is easily a 1 coat polish. In preview pictures “Spirit of the Moors” was the instant stand out for me and I still absolutely love it in real life, however I think because I already knew it was going to be amazing it isn’t quite so overwhelming and is now more in the middle of the collection for me. This is an incredibly intense blue and really makes me think of the gloriously bright blue skies you can get over the moors on a perfectly cloudless day. 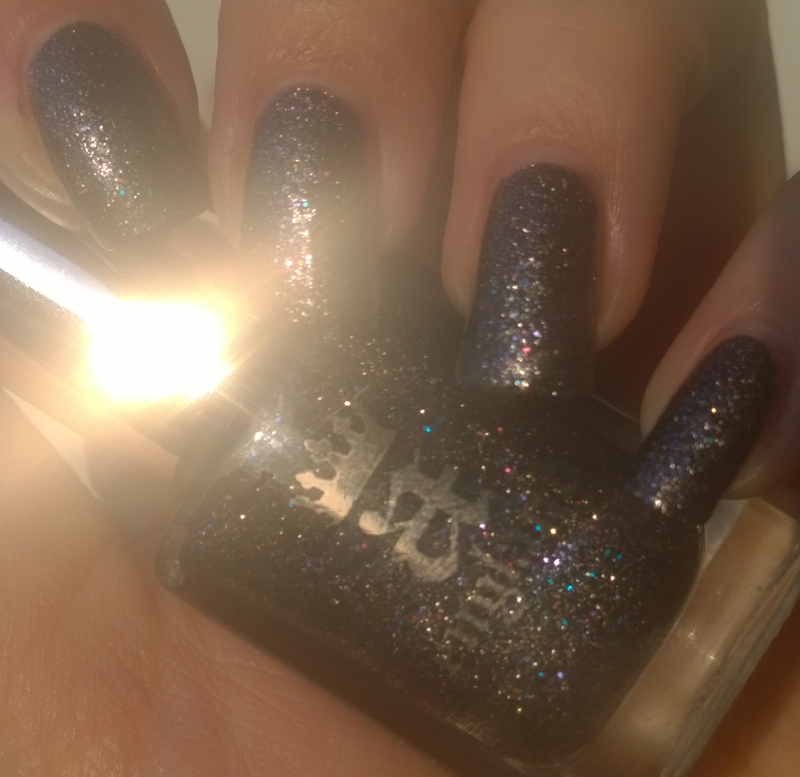 Combined with the intense silver shimmer (it’s almost half blue and half silver, there’s that much shimmer in this polish!) it really shines with beauty and has the odd hidden sparkle of green as well. You could get away with 1 coat on this one but I prefer the 2. 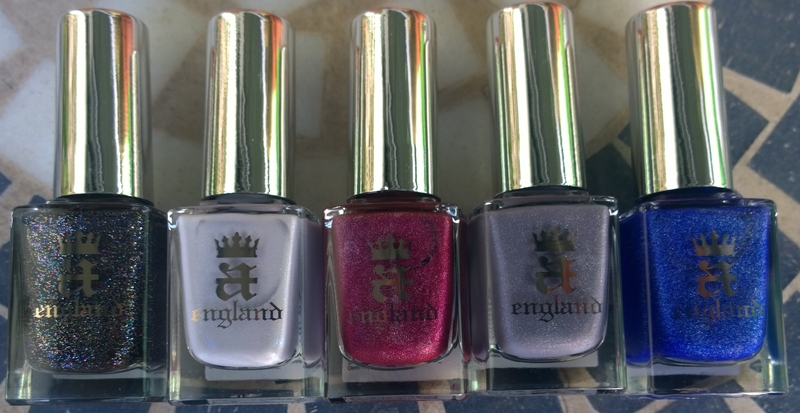 Well of course one of the polishes had to be called “Wuthering Heights”. I have to say this is my favourite of the bunch. Like Cathy, it’s one that didn’t look amazing in previews but I’m a sucker for greys that aren’t silver anyway and again like Cathy once I got this on it really stood out for me. 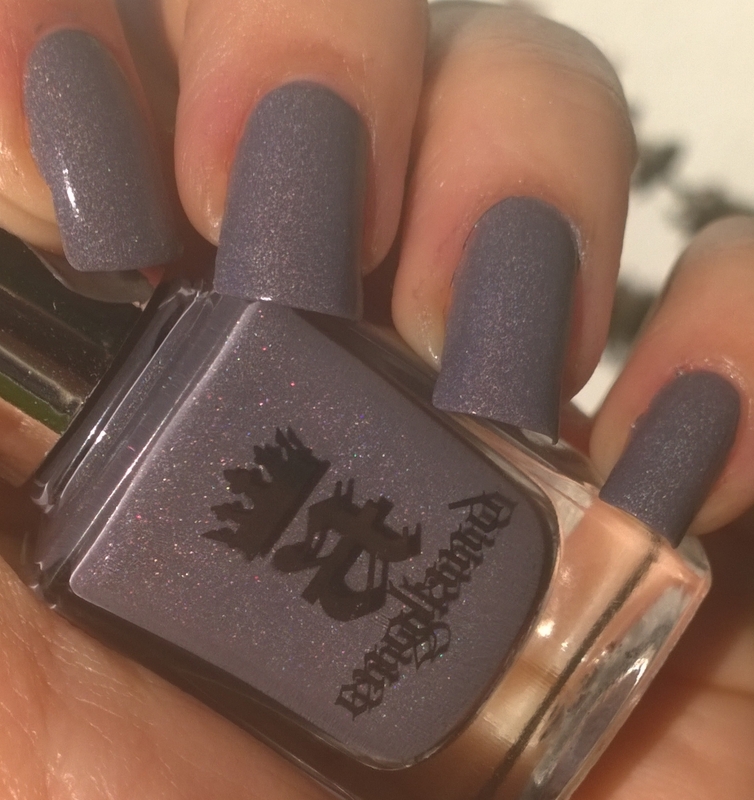 In fact 2 friends at work felt the same when trying it on and decided it was really lovely, one of them having only recently given me one of her polishes because she’s not a fan of grey! This is a warm, slightly purple-toned grey (I want to call it dove grey) with a subtle silver shimmer to it. It definitely gives me the same impression I got of the house in the book; on first glance a bit dingy, maybe run down but when you look closely it reveals the potential for some real beauty. This is another that can easily be a 1 coater but again I preferred 2 just to bring out the holo. Another gorgeous collection from Adina and full of stand out colours. It feels very different to any of the other collections to me and I am definitely going to be wearing a lot of this one over the next few months. I will do some comparison shots for Let Me In/Briar Rose/Rose Bower and post those but they are definitely all different enough to be worth having all 3! As always I don’t feel my camera has managed to truly pick up the beauty of these polishes, except for maybe on Heathcliff. Glitter is always easier to photo than holograph.